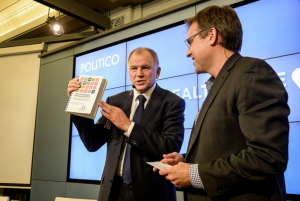 On 10th November, POLITICO organized its first Annual Health Summit on “Health Care: Access to Safe and Affordable Medicine”. An affordable access to treatment is among EBC’s core advocacy activities as the cost of accessing the market with new drugs is still prohibitive for certain disease areas, costing patients, companies and national health care systems alike, despite its large developments. The event brought together industry leaders, policymakers, regulators, providers, payers and patient representatives to discuss what it takes to make innovation affordable and medicine safe and accessible. Among the panelists were for instance Vytenis Andriukaitis, European Commissioner for Health and Food Safety, and Maggie De Block, Minister for Social Affairs and Public Health of Belgium. How can drugs access the market at prices that patients and national health services can afford? How can costly R&D and innovation be made worthwhile for companies? What kind of regulation is needed to ensure safe, affordable and accessible drugs for the population?